kicad StepUp script hacks MCAD world! 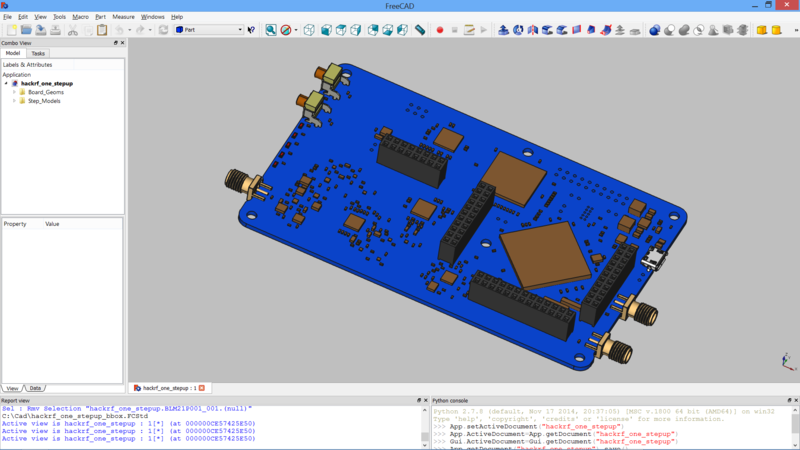 with this hack, you can finally export your kicad board and assemblies to MCAD world! This project was created on 10/03/2015 and last updated 6 months ago. kicad StepUp is a new approach to export kicad board and assemblies in STEP AP214 (with colors). The kicad StepUp script maintains the usual way to work with kicad, but improves the process to work in a collaborative way with mechanical designers bringing near ECAD and MCAD environments. The Hack is done reverting the usual workflow: instead of exporting 3D from kicad to VRML and then convert VRML to STEP (that will produce very bad results) I started from STEP models, converted STEP to VRML, and assembled STEP models in MCAD to have the same layout that will be displayed in kicad 3d VRML viewer. the user has just to substitute Wings3D as modeler with FreeCAD. or getting models from online libs or from the parametric 3D lib expressly done to kicad (https://github.com/easyw/kicad-3d-models-in-freecad/tree/master/cadquery/FCAD_script_generator). Once you have your 3D MCAD models, you need to have a copy of that in STEP and VRML format, and export the board to IDF. Just put your models in the same folder in which normally you are used to put vrml models, and the script will assembly the MCAD board and models as in 3d-viewer of kicad. The script is Open Source and works in Windows, Linux and OSX. The conversion from ECAD to MCAD can be done with all the modules or with bounding boxes of all or all but e.g. connectors and edge parts, so to have the accuracy of the pcb assemblies only when needed, maintaining the model light as required. With &apos;kicad-StepUp-tools&apos; it is possible to load the kicad footprint in FreeCAD and align the 3D part with a visual real time feedback of the 3d model and footprint reciprocal position. Once the 3D part is aligned to the footprint pads and silk, the model can be exported in STEP format and in VRML format for kicad 3d-rendering, just clicking on the Scale to kicad VRML button. That will align EDA to MCAD 3d viewers. No need to reiterate the aligning process or empiric calculate offset and rotation to apply to VRML model. With this tool is possible to download a part from on-line libraries (e.g. 3dcontentcentral, grabcad, etc), align the model to kicad footprint and export the model to wrl. That will produce a 3d VRML model exactly aligned to footprint as in mechanical CAD. The result 3D MCAD model will have the accuracy of the pcb and assemblies only when needed, maintaining the model light as required. Finally KiCAD StepUp can bring top & bottom tracks and silk screen inside FreeCAD for a full mechanical integration. Added the ability to load multiple pcb boards, here in nice OSH Park purple pcb color! KiCad StepUp, after more than two years has became the suggested way to create STEP and WRL models for official Kicad 3D package library. In this period many features have been added, but the latest I just released is a full FreeCAD Workbench that can be easy installed from inside FreeCAD. In the new KiCad StepUp WorkBench there is also a new feature to improve ECAD and MCAD collaboration: The Sketcher. I opened a new project @Hackaday to explain in detail the new WB and its features. Nice work on StepUp , thank you for this. I would love to use your library, can you recommend a best-practice how to take your generated 3d library and make them available in KiCad, preferably as default 3d parts? So for this to work I have to have a .step file and a .wrl file for each component on my board? Is there some standard library that I can import to avoid this for the common parts? Takes 3D surface scans at close range. It is simple to construct as it uses off the shelf hardware and software. How a silly mistake led to a 3D printed part. You are about to report the project "kicad StepUp script hacks MCAD world! ", please tell us the reason.